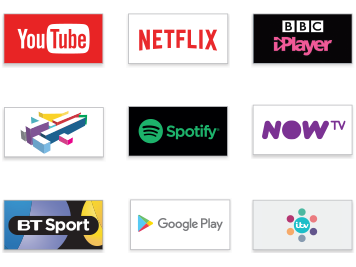 *Performance of certain Chromecast features, services and applications depends on the device you use with Chromecast and your internet connection. Subscriptions and/or charges may be required for certain content. Casting optimised for selected services only. Streaming quality for other content may vary. 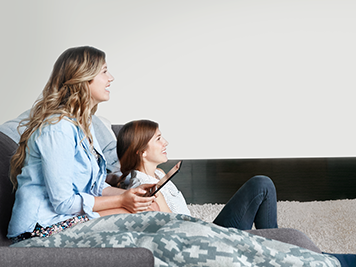 Enjoy your favourite mobile apps on the big screen and turn any TV into a smart TV with Google Chromecast. It's simple to set-up and easy to use. 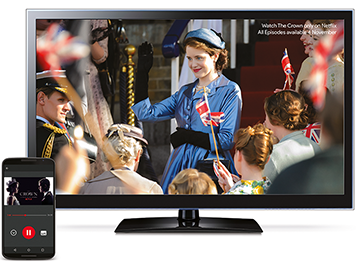 Stream from a phone or tablet to your TV with just a tap. Connect Chromecast to your TV, tap the cast icon in YouTube, Spotify, Netflix or any other supported app on your device, and enjoy it on the big screen – without draining your battery. It's not just about entertainment – cast tabs from Google Chrome or mirror the screen of your Android phone or tablet to Chromecast, and surf the web on your TV. You can even turn your TV into a live picture frame for your photos or works of art. Make your TV smart with Google Chromecast. Set it up in three simple steps and start streaming straight away without having to worry about logins or downloads again.